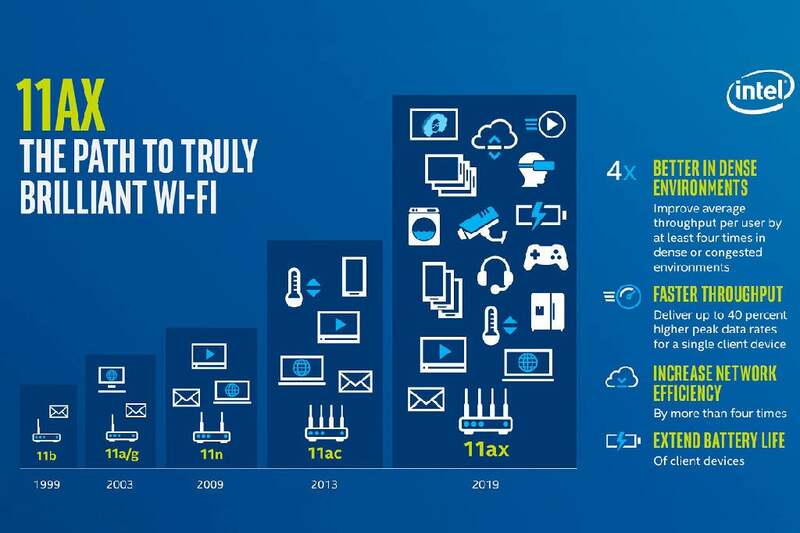 Wi-Fi networking is poised for a major update: The transition from 802.11ac to 802.11ax promises a modern networking hub that can cope with the burgeoning number and diversity of wireless devices that need access to your broadband connection. At the dawn of the modern smartphone era in 2007, even a highly unplugged home might have only a handful of hardware connecting to its wireless router. Now—if you use tablets, smart-home devices, media streamers, smart TVs, gaming gear and security cameras—you could have 20, 30, or many more. And that number won’t get smaller in the future. With 802.11ax, the IEEE engineering group that drives standards like wireless local area networking (WLAN) has pushed hard in several directions to make these complicated environments work. There are a lot of benefits for dense corporate networks that need massive throughput and could have tens of thousands of roaming and fixed Wi-Fi clients, but there’s no shortage of upsides for home users or small offices, especially when it comes to video streaming and file transfers. 802.11ax enables large numbers of clients on a home Wi-Fi network to operate simultaneously without degrading video-streaming and other devices that require lots of bandwidth. Corporations also control the wireless networks in their buildings and throughout their campuses, while home users and small businesses can face several to dozens of networks within radio earshot. Several techniques in 802.11ax will reduce the effects of interference and increase throughput in crowded urban and suburban environments, reducing typical frustrations that are hard to troubleshoot or fix. The standard hasn’t been completed yet, but manufacturers are jumping the gun as they have with every new flavor of Wi-Fi for more 15 years. As a result, some equipment could be on the market as early as June, and more is coming later in the year. But the advantages of being an early adopter might pale in favor of waiting for a fully baked version that’s stable and is supported by the client adapters onboard phones, laptops, and other gear. To explain the advantages of 802.11ax, we must drill down briefly to review how Wi-Fi works. The airwaves are regulated nearly everywhere in the world, and in the U.S. and in most countries, two chunks of frequencies are allotted to uses compatible with Wi-Fi: the 2.4 gigahertz (GHz) band and the 5GHz band. These bands are further divided into channels that have a set starting and ending frequency. Senders and receivers, like a Wi-Fi router and laptop, agree to use the same channel to communicate back and forth, and dozens (or even hundreds) of devices can use the same channel at the same time to relay data via an access point. In cities and suburbs, dozens to hundreds of networks might also be contending for the same channel in relatively close proximity. Way back in 1999, the 802.11a standard for 5GHz and 802.11b for 2.4GHz started the WLAN revolution, offering data rates of 54- and 11Mbps, respectively. 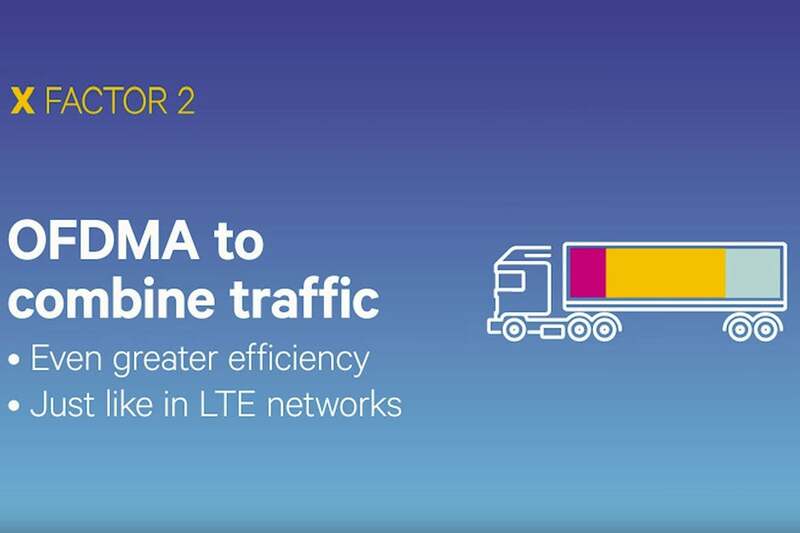 These rates were always the maximum possible and included network overhead, so devices saw often 40- to 90-percent less throughput. Wi-Fi advanced through 802.11g (2.4GHz), 802.11n (2.4GHz and 5GHz), and two releases of 802.11ac (5GHz) Wave 1 and Wave 2. The 802.11ax standard improves performance in both spectrum bands, and will deliver potentially several gigabits per second of throughput to dozens of devices at once on a single channel. That’s incredibly helpful if you’re streaming compressed HD and 4K HDR video or transferring multi-gigabyte files around a network. An increasing number of people worldwide have 100Mbps to 1Gbps broadband connections, which can be constrained by slower Wi-Fi networks. 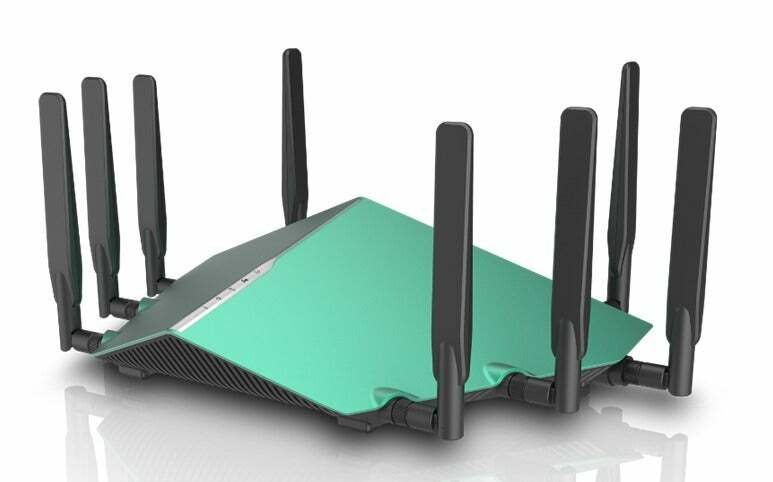 D-Link's AX6000 will be one of the first 802.11ax routers to hit the market. Each successive update to Wi-Fi has pushed data rates higher, but 802.11ax offers a huge boost by adding several varied techniques, each of which adds a unique advantage. Taken together, the maximum raw data rate across an 802.11ax base station (e.g., a Wi-Fi router) could be a whopping 14Gbps compared to just 3.5Gbps for the best similarly configured 802.11ac router. In practice, you will never see that maximum potential speed, but 802.11ax is still poised to offer multiple times the rates of 802.11ac, and will better meet solid requirements for video with many people streaming or transferring files at once. Wi-Fi encodes data into radio waves, and there are calculable limits to how much data can be carried at a given frequency. WLAN standards, however, are still working toward that upper maximum. Over time, the chips that process signals have become more powerful, allowing more efficient cramming of data into the same space, especially over very short distances between a base station and a receiving device, typically in the same room and with line of sight, which is perfect for video streaming. OFDMA (Orthogonal Frequency Division Multiple Access) allows mingling data for different receiving devices across transmissions, like packing a truck full by combining palettes of boxes intended for different recipients. 802.11ac started down this path, allowing encodings with 33 percent more data than 802.11n; 802.11ax bumps that up another 25 percent. As an analogy, consider egg cartons made up of squares with an inset circle for eggs, arranged in rows and columns. Now, replace the square with a hexagonal grid with less cardboard between each egg. That might result in more broken eggs, just at these densely packed wireless signals can suffer some loss via error, but you typically wind up with many more eggs. The 2.4GHz band is often given shorter shrift, because it’s crowded full of other so-called unlicensed uses that rely on wireless data—like baby monitors, wireless doorbells, cordless phones, and the like—that don’t play well with high-speed Wi-Fi networks. 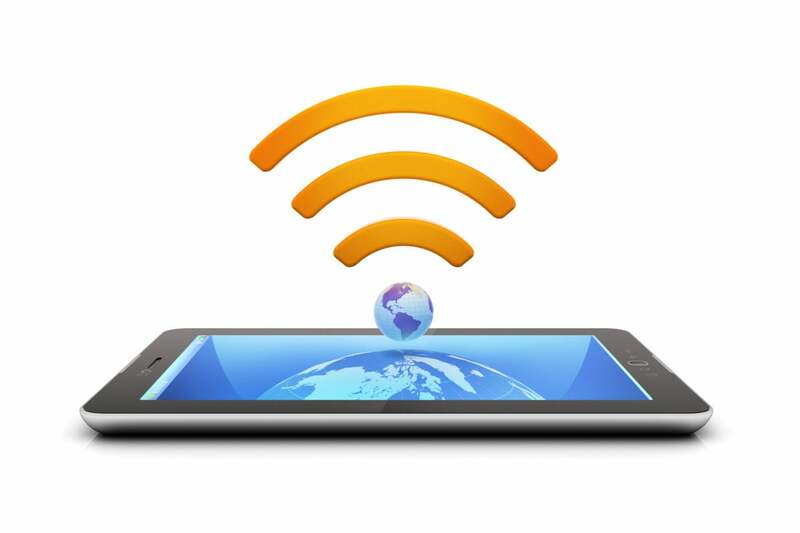 Many of those non-Wi-Fi uses have shifted to other bands or now rely on Wi-Fi. 802.11ax is the first standard in more than a decade that improves performance in 2.4GHz, which opens up as many as gigabits per second more data while also taking advantage of that band’s long wavelengths compared to 5GHz: longer wavelengths better penetrate solids objects, like walls, floors, and furniture. This is especially useful for mesh networks, in which current mesh nodes typically have two radios, one for 2.4GHz and one for 5GHz, one of which is used to communicate among nodes. With much higher data rates on the better-penetrating 2.4GHz band, mesh networking with 802.11ax will result in better throughput across a whole network. 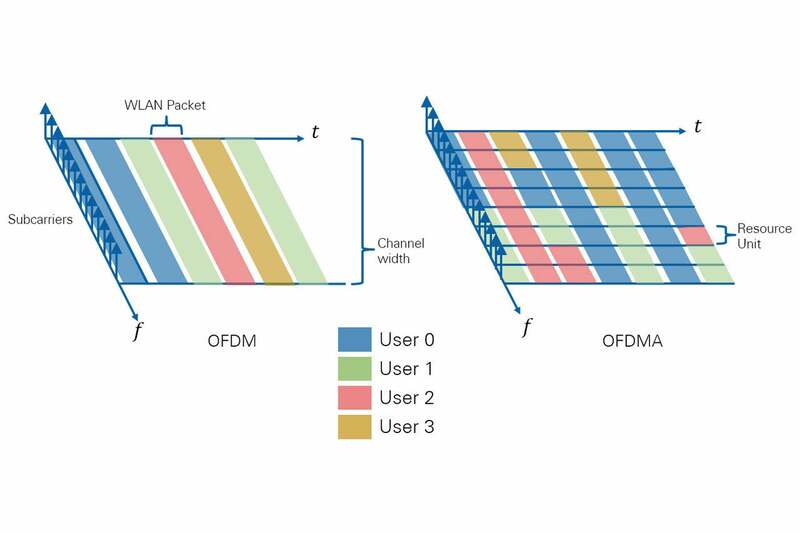 The 802.11n standard added a spatial multiplexing technology known as MIMO (multiple in, multiple out). MIMO is a means of sending multiple streams of data across different physical paths, like playing billiards with radio waves. This required multiple sending and receiving antennas and the equivalent of additional radios for each stream. But many devices, especially small mobile and smart-home units, didn’t have multiple radios. A wireless router with MIMO thus wastes much of its potential bandwidth at any given time when it’s constrained to a single stream. MU-MIMO allows Wi-Fi routers and access points to communicate simultaneously with multiple devices, reducing wasted parts of transmissions. Starting with 802.11ac, routers gained the ability to talk simultaneously with different devices at the same time (multiple-user or MU-MIMO), improving efficiency. In 802.11ax, client devices can now also respond simultaneously. That’s extremely helpful for streaming media players, allowing more reliable audio and video playback to first pass from the player to the router, and then from the router to your viewing or listening device (e.g., your smart TV, media streamer, smartphone, or digital audio player). 802.11ax also doubles the number of possible streams from four to eight, but that feature is likely to be seen only on expensive enterprise equipment, not home devices. You could think of data traveling over your Wi-Fi network as if it were the cargo carried by big rigs. In some of the earlier Wi-Fi standards, each truck could carry only one type of cargo, even if the truck was only partially full. You might think of this as the difference between having one giant truck with a single large packing container inside occupying an entire highway, and many smaller trucks with very thin dividers between lanes carrying a variety of boxes traveling on the same highway. 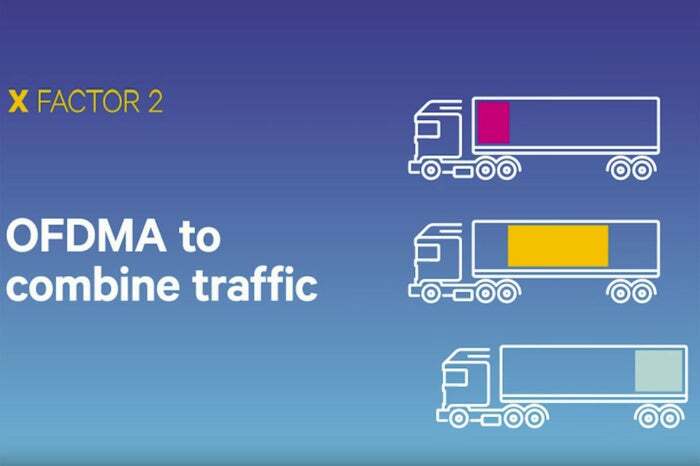 Analysts and manufacturers say that in the right circumstances, OFDMA could allow four times the throughput as with current networks. In many cities and suburbs, dozens to hundreds of Wi-Fi networks overlap. 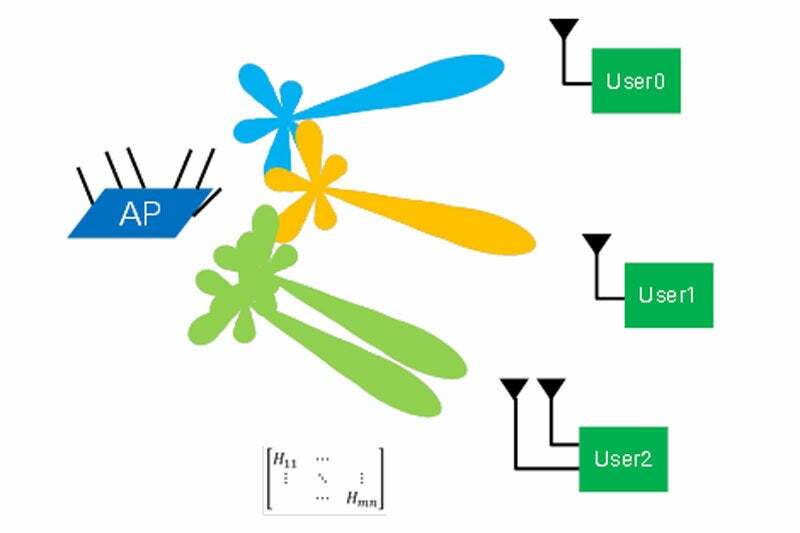 802.11ax includes a technique that will let the standard discriminate between the network you’re on and weakly received signals from other networks, which in turn allows greater throughput. While the elements above might seem technical enough, a number of other small improvements add up, including letting 802.11ax break up data for a single destination into different sized chunks to fit into available slots, using longer runs of encoded data, and better focusing energy for “beamforming” to target receiving devices more exactly. 802.11ax is also better at avoiding conflicts where devices talk over one another, called contention. Here’s one more bonus that’s not related to speed: Various mobile-targeted improvements, including one that tells network client devices that put their Wi-Fi radios to sleep to conserve power when exactly to wake them up. This could dramatically reduce Wi-Fi-related power consumption, extending battery life. While the standard is still under development at the IEEE task group, some manufacturers are prepping for the near-term release of Wi-Fi routers that will be labeled 802.11ax, even though they’re using a preliminary version of the spec as interpreted by a single manufacturer or chipmaker. D-Link and Asus announced routers at CES in January, and as chipmakers get close to finalizing 802.11ax chipsets, we’ll see more manufacturers start to make their plans. 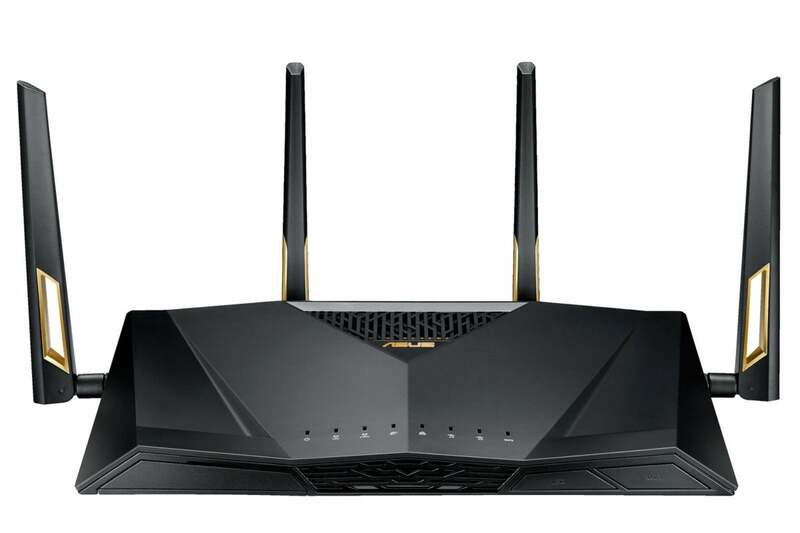 Asus intends to be early to the 802.11ax router market with its RT-AX88U Wi-Fi router. Buying early could come with a cost. With the last few rounds of standards, changes were significant but constrained, and few routers had issues with obtaining updates to bring them into full compliance. 802.11ax, however, has so many substantive improvements and differences that it’s possible early routers won’t be as robust and compliant as ones created using later generations of chips. Manufacturers and chipmakers sit on the IEEE committee making decisions and are part of the Wi-Fi Alliance that certifies products as interoperable, but it’s still a risk. Few of 802.11ax’s advantages can accrue without new client adapters in phones, tablets, computers, and other devices, and those always come more slowly as new generations of equipment are introduced. While 2019 will likely be the year that 802.11ax starts to appear in hundreds of millions of new devices, it will still easily be two or three years before you have enough new equipment to take full advantage of the new technology. Backward compatibility is always a concern for new generations of hardware, but the history of Wi-Fi has largely encompassed all previous standards without too much compromise. Routers that declare themselves as supporting 802.11ax will also seamlessly handle every previous 802.11 standard, typically back to 802.11g, the first version to support more modern network security methods. With few exceptions, you can keep using all the devices you used in the past. You won’t need to configure anything special to enable backwards compatibility, although some routers may have modes you can turn on that disable older forms of Wi-Fi. Compatibility comes with an overhead cost, and turning off older modes can boost performance somewhat. This story, "Wi-Fi gets quicker with 802.11ax, but buying early might offer few advantages" was originally published by PCWorld.